It can be scary if your car starts to suddenly show signs of engine damage, but if you have an understanding of how the components in your vehicle function, it can help you determine what needs to be repaired. An alternator is an important component that should stay in optimal shape to help your engine perform well. 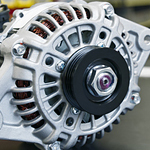 Read our summary below to learn more about your vehicle's alternator. The battery, starter, and alternator make up your vehicle's charging system. The alternator's primary function is to keep the battery charged with the vehicle is running, but it also helps electrical components function, such as the windshield wipers. Signs that your vehicle's alternator needs to be inspected include dim lighting, a burning smell, and a high-pitched sound coming from under the hood. At Eastside Kia in Calgary, one of our service technicians will be happy to inspect your alternator.